The Pittsburgh Steelers outlasted the Baltimore Ravens on Sunday night, winning 39-38 after being behind the majority of the second half. QB Joe Flacco had a solid night, going 20-of-35 for 269 yards and throwing two touchdowns compared to just one interception. RB Alex Collins had an good statistical game, rushing for 120 yards on 18 carries. WR Mike Wallace was the Ravens’ leading receiver in the game, catching three passes for 72 yards. As usual, QB Ben Roethlisberger, RB Le’veon Bell, and WR Antonio Brown were critical to the Steelers’ success on offense. 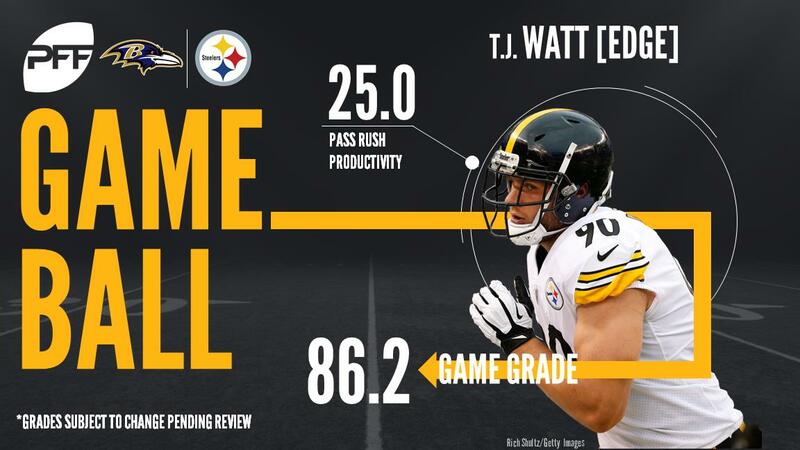 Bell had two touchdowns on the ground and a third through the air, Roethlisberger passed for over 500 yards and two touchdowns overall. Brown contributed no less than 213 receiving yards, 34 of which came on one reception to put Chris Boswell in range to kick the field goal that would put them up for good. With that, we give you our PFF-exclusive takeaways from the contest for each team. Despite not finding the end zone for the first time in a month, Brown had highly productive game, with a season-high 213 receiving yards on 11 catches. He did, however, fumble the ball once and while it was fortunate for him that the ball ended up out of bounds, it did impact his grade. The Steelers didn’t run the ball much, but Bell did his best to make the most of his runs despite a below-average night from the offensive line. He forced three missed tackles as a runner and found the end zone twice. In addition, he caught nine passes on 10 targets for 77 yards and a third touchdown. It was Watt’s sack-fumble on the Ravens’ Joe Flacco which ended the game but he had been productive up to that point rushing the passer. Watt finished with a career high six total pressures and three stops in the run game. He’s had a productive rookie year for the Steelers, tallying 28 total pressures and notching 25 stops. The fourth-year player out of Notre Dame has been an integral part of the Steelers defense and occasionally gets overlooked with the likes of Cameron Heyward on the defensive front. Tuitt has been a consistently good pass-rusher since entering the league and he added six more pressures tonight, giving him 33 total on the season. Collins ran through and around the Pittsburgh defense, he forced ten total missed tackles and 95 of his 120 rushing yards came after contact. His only blemish was a fumble in the first half after catching a pass, other than that Collins played his best game of the season. He has now forced 30 missed tackles in the ground game, with 500 of his 825 yards coming after contact. Flacco was able to find success under pressure, averaging 10.9 yards per attempt and going 8-of-14 while under duress but it was the sack fumble on the last play which ultimately cost the Ravens. 19 of Flacco’s 35 attempts traveled under 10 yards through the air but he didn’t shy away from taking deep shots, going 2-of-5 for 70 yards on throws over 20 yards. For the third consecutive week, Suggs finished the game with seven total pressures after having five-plus pressures in just one game over the first 11 weeks of the season. He had one sack and six hurries, largely coming against RT Chris Hubbard. While Brandon Carr struggled in coverage, Humphrey had a pretty solid outing overall. He was targeted 12 times, allowing just six completions for 37 yards, only two of which went for first downs. When he was covering Antonio Brown, he allowed just two catches for seven total yards on five targets.